The more I’ve travelled in the past 5 years, the more I’ve wondered if I’ll ever find my perfect place as a digital nomad. That to me, is a place with incredible natural beauty, good wifi, far enough from civilization yet with a diversity of food that keeps my tastebuds salivating, culturally immersive. There is also that indescribable factor, that feeling of being there, not wanting to be elsewhere. For a restless soul like mine, that feeling is rare. I first lay eyes on Lake Atitlan in 2014, on my first trip to Guatemala. Even on a rainy evening, as my bags and I got drenched on the ferry along choppy waters, I gaped wide-eyed at the three volcanoes – San Pedro, Atitlan and Toliman – that imposingly and protectively loom over the lake. I spent a blissful week in my eagle’s nest, a solar-powered studio in San Marcos La Laguna, detached from civilization and observing life in my little Mayan village, playing basketball with Mayan boys and girls, hiking in the surrounding mountains (Also read: Awe-Inspiring yet Affordable Airbnbs in Central America). I promised to be back like I always do, but I had no idea if I’d follow through. Then this year, after two months of whirlwind travels – exploring the Hessen region in Germany, discovering my adventurous side in North Wales, and indulging in vegan goodness in New York – I needed a place to slow down and catch up on work and life. When my friend suggested Central America, I closed my eyes and saw myself on the shores of Lake Atitlan again. The perfect vacation rental, a French-built loft near San Marcos La Laguna was written in our stars. It usually gets sold out months in advance, but we managed to score it a day in advance! Every morning when I woke up, I opened the windows and felt like I had just started dreaming. I kept my promise to be awake for more sunrises, and Lake Atitlan kept delighting me with bright red and orange skies, fishermen setting up nets in the golden morning light, and the active volcano Mount Fuego erupting far in the horizon. And when the day got warmer, we jumped into the lake and swam in the clear waters – the perfect wake up call. In the inspiring volcanic backdrop, I had my most productive month this year; writing, blogging, pitching, finishing half-baked ideas, dreaming up new projects. I know many people scorn when they see a laptop in an incredible backdrop, but for me, this inspiration is what keeps my long-term travel lifestyle alive and sustainable. We soaked up the indigenous Mayan culture in San Marcos La Laguna, hiked along the gorgeous cliffside route from Jabalito to Santa Cruz, kayaked in the lake on a cloudy morning, took Spanish lessons and found the coolest football field in the world! I indulged my vegan tastebuds in local Guatemalan food – beans, tortillas, guacamole, rice… but it was hunting for local ingredients to cook at home that I loved more. In Jabalito, buying basil to make pesto had the local vegetable seller running to his backyard to cut us some fresh leaves. Once in San Marcos la Laguna, when the local vendor ran out of fresh mint, a Mayan neighbor who was admiring their wild forest mushrooms, invited us to get some from her organic garden! I nearly perfected the art of making hummus and moutabal at home… little joys of being a nomadic vegan. Evenings were for Moza/Gallo beers and magical sunsets. When night fell, lightening storms and thunderous clouds rolled towards the lake, as stars danced in the dark skies. The month flew by, and for once in my life, I wasn’t dreaming of lands further away. I wanted to stay, I wanted to wake up to those volcanoes again, I wanted to jump into that lake again, I wanted to stay. But alas the loft we were staying in wasn’t available, which I took as a sign of other lands and people calling. I picked up pieces of my ailing heart, and like an old lover who I know will wait for me, I said goodbye to my beloved Lake Atitlan. The time is not right to stay today, but it will be someday. As I waited for the ferry to transport me back to the outside world, the skies and waters burst into the colors of love; the last sunrise. For now. How to get to Lake Atitlan: Guatemala City has the closest airport. Spend a few days in the charming Spanish colonial town of Antigua nearby, then take a shuttle bus (3-4 hours) to Panajachel or San Marcos / San Pedro, depending on which is closer to the village you are staying in. It costs 15$ per person. Which village to stay in on Lake Atitlan: Several small Mayan villages are scattered along the shores of the lake. I love San Marcos La Laguna for its tranquility, spectacular views on the lake, an intimate glimpse of the Mayan culture and plenty of cafes and yoga options. I also love the stuck-in-time feeling of Jaibalito. It’s easy to get around between villages on the public lancha (boat) that runs frequently during the day. When to go: I’ve travelled twice to Lake Atitlan between September and November, and love that time of the year for its cool weather, occasional rain and incredible sunsets / sunrises. I’ll be writing a more detailed guide on Lake Atitlan and Guatemala soon! Have you found a place that feels like your place on earth? What kind of place is it? Join The Shooting Star on Facebook, Twitter and Instagram for more musings on life as a digital nomad around the world. Just beautiful …I am speechless….. SO awesomely recollected .. loved this post. Such a lovely post! Keep writing and inspiring Shivya ..
I’ve never heard of this place before but it sounds incredible! The pictures are also brilliant. Breathtaking dear….I loved each and every picture and for a moment you transported me there. But my personal favorites are the football ground by the waters, shining stars, rustic village by mountains and the ones where you kept looking at the clam mountains. From the time I have known of this place, it found a place in my bucket list. Thanks for sharing your view/experience. Thank you…keeping my fingers crossed. What a nice article. 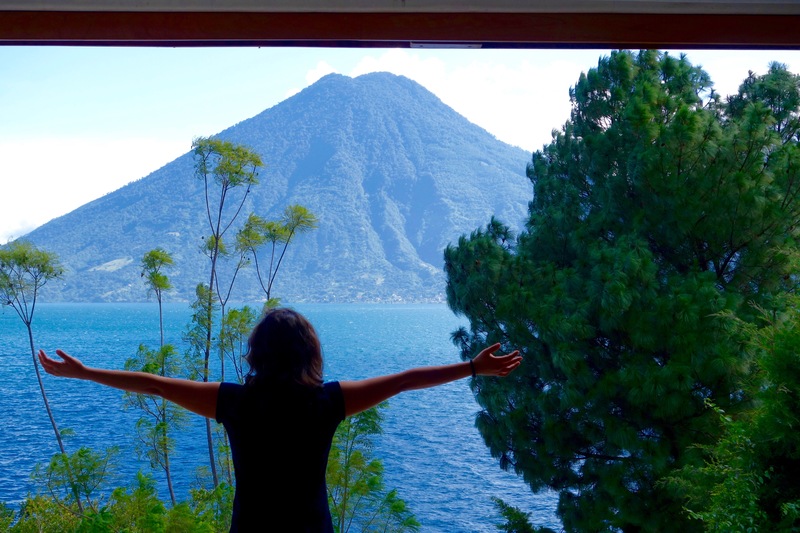 It’s clear that you have a special fondness for San Pedro and the Atitlan area. Your photos are wonderful. . .not only for this story but for those that accompany all of your blogs. I’ve followed your travels for awhile and have enjoyed your insightful, objective descriptions. I wonder if you might post some of the costs in Guatemala, particularly for lodging. Thanks for the armchair travelogue. Thanks Cam! I didn’t particularly like San Pedro (too crowded, doesn’t feel like you’re on the lake), but I loved San Marcos, Santa Cruz and Jaibalito 🙂 I’ll be writing a detailed guide to Guatemala soon, including costs! Is it the same Bajaj Auto plying in Guatemala? Most beautiful and inspiring post. Wow. I felt so good after reading this….i cannot imagine how beautiful it wud be, to be there. Lovely photos – you entice me with them and your words. It sounds like our kind of place. And I know exactly what you mean about being on your laptop while resting in a beautiful place. The creativity of writing and photography (and for you making a living) is enhanced in such a beautiful setting. I did the same when we had two weeks at a small hotel at the quiet end of the quiet beach on Koh Samui. And in many other places. Even now in Playa del Carmen. Thank you for this information. It sounds wonderful. We plan on heading to Guat in the new year so Lake Atitlan goes on the agenda. Lake Atitlan is such a wonderful and magical place. You will not be disappointed! Having just recently returned home from staying a week at some of the different villages around Lake Atitlan, I thoroughly enjoyed reading this post and it brought back good memories of my time spent there. It is really such a paradise and it’s addicting. I could have spent so much longer there, just wandering the streets of the various villages, enjoying the sunsets and sunrises, eating delicious vegetarian food and relaxing by the water. Thank you for sharing this! I am sure we will both be back to this amazing place many more times in the future. Beautiful, as always. Love your words. Just found my home here in New York! And we were in a remote island in Alaska called Dutch Harbor/Unalaska before that! Haha. Love love love this post, it’s breath taking. The food looks super delicious. Did you have any problem with communicating with the locals? Can you get by with just English? My wife loved Lake Atitlan when she visited 6 years ago. The beauty, peace and overall way of life agreed with her on many levels. She also dug trips into town. So I reckon I’d vibe with life down there too….and hey, with the gorgeous pictures you shared, what’s not to like about the place?! Brilliant imagery and super write up. We thought about doing Guatemala last year but will definitely visit it within the next few. Beautiful post and lovely blog. I visited Lake Atitlán about 10 years ago. We stayed in the village of Santiago Atitlán and it is one of my favourite travel memories. Your wonderful photos of the lake, volcanoes, sunsets…are calling me back. Great country. Wow amazing captures and the food there was awesome. Need to try this definitely. Hi Shivya , very nice article. I like the way you click pictures for your blog. Is it possible to make a separate picture gallery where we can get more pictures to see. I want your job. Need a side kick? I will try to go next summer! It’s really nice..want to go. Oh this is absolutely beautiful.. absolutely envy ur life 😀 and I love the fact that u managed to do this with ur veganNess.. so is this time of the year good to visit Guatemala and the Lake? Previous PostAn Open Letter to Indian Parents: Let Your “Kids” Travel. Next PostQuirky Ways to Discover Frankfurt.